Do you think there is any point to life at all? Tonight, I don’t think there is any point what so ever. If you ask me tomorrow, I might be of a different mind, but for right now, life seems to be pointless. I suppose it might be one of those instances where I am just not intelligent enough to see the point. Hmmmm…. I sit here, well past the half way point in my life and I can’t really say that I have accomplished anything that will be remembered 20, 50 or a 100 years from now. Mind you, I am in pretty good company as the vast bulk of people that have inhabited the world go unmarked and unremembered. Not just every day people like me either, most of the kings, queens, popes, emperors and tyrants have disappeared into the depths of time. I guess no one really changes anything. There are men and women that achieve wonderful and marvellous things in their lifetimes, but before you know it, they too fall into oblivion. Even fairly recent medical miracles like that of Jonas Salk, Banting and Best, Alexander Fleming and others that have changed and prolonged our lives are now slowly being forgotten, because the diseases they have “cured” are now starting to affect us again because the young simply don’t remember. I just hope the Black Death doesn’t come back. Like I say, there doesn’t seem to be a point…tonight. 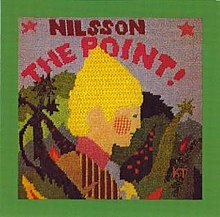 Well, if there is a point to the blog today it is that it reminded me of an album from 1971 by Harry Nilsson Called “The Point”. “The Point” has been an album, a musical play and an animated film. I’ve seen the film, but I don’t suppose I will ever see the play. I have been listening to “The Point” and so should you if you have an hour or so to fill. I guess there is a point after all.